Lyme disease is a bacterial infection contracted primarily through the bite of a deer tick/black-legged tick, lone star tick and dog tick. The Lyme Disease Association of Southeastern Pennsylvania, Inc. (www.LymePa.org) also reports that some researchers believe that other ticks and some biting insects such as mosquitoes, fleas, biting flies, and lice may also transmit Lyme disease. Initially, it may cause flu-like symptoms. Untreated or undertreated, it may cause long-term illness that can affect many bodily systems. 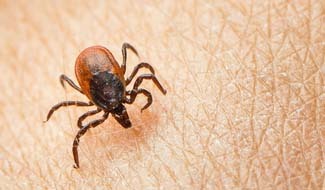 According to the International Lyme and Associated Diseases Society (ILADS.org), fewer than 50% of patients with Lyme disease recall a tick bite and fewer than 50% of patients with Lyme disease recall any rash. Lyme disease has been called the great imitator and should be considered in the differential diagnosis of rheumatologic and neurologic conditions, as well as Chronic Fatigue Syndrome, Fibromyalgia, Somatization Disorder and any difficult-to-diagnose multi-system illness. The onset of Lyme disease symptoms can be easily mistaken for other illnesses. Once symptoms are more evident the disease may have already entered the central nervous system, and could be harder to cure. Lymedisease.org offers several compiled lists of symptoms that you can reference. Don’t forget to check your symptoms against co-infections too. This comprehensive list shows 21 co-infections and their related symptomology. According to many experts, there are no reliable tests for Lyme disease. Instead of solely relying on tests, doctors need to base a diagnosis on your symptoms, medical history, and exposure to ticks (often referred to as a clinical diagnosis). If you believe you’ve been bitten by a tick, you can take a short questionnaire developed by Lyme disease expert Dr. Richard Horowitz to determine your likelihood of having Lyme and associated tick-borne disorders. Take the questionnaire. Another step to take is testing the tick itself, which tests the tick’s DNA for tick-borne infections. The following are just a few resources for tick testing. Because there’s limited research on Lyme disease, there are a lot of myths and misinformation around in the mainstream. PA Lyme Resource Network (www.PAlyme.org) has complied scientific evidence to help dispel some of those myths under its “Resources” tab. ILADS.org indicates that up to 50% of ticks in Lyme-endemic areas are infected. Here in Pennsylvania, the causative agent of Lyme disease was found in ticks in all 67 counties. Pull upward with steady, even pressure. Don’t twist or jerk the tick; this can cause the mouth-parts to break off and remain in the skin. If this happens, remove the mouth-parts with tweezers. Tree of Life founder Bob Miller, who also formed the NutriGenetic Research Institute, recently conducted three in-depth studies investigating the possible correlation of genetic variants with those dealing with chronic Lyme disease. He discovered that people with chronic Lyme disease do have higher genetic variants than the controlled study group. However, it’s uncertain how these SNPs may impact those with chronic Lyme, and if nutritionally compensating for genetic variants improves the quality of life for those with chronic Lyme, or supports medical treatment being more effective. Read more about these research studies. Watch a video that highlights findings from the first study. Watch the ““Lyme disease – are your genes making you ill?” seminar that Bob presented to Nordic Network for Vector-borne Diseases (NorVect) in Oslo, Norway. If you’re looking for a Lyme Literate Medical Doctor, www.ILADS.org has a referral program as does www.PALyme.org for physicians within the state of Pennsylvania and neighboring states. Tree of Life does not diagnose or treat Lyme disease; for this, you must see a licensed medical doctor. However, we do provide complementary nutritional support for those challenged with Lyme.